Sometimes, I just want to fry something. I want the delicate crunch only obtained by high heat and a ridiculous amount of oil. I want spring rolls. Hell, I want avocado spring rolls with tomatillos, black beans a hint of red onion. Deep breath. Let’s count to ten and calm down. We can pan fry to get the same effect. A little less oil is absorbed and there is less worry of the spring rolls exploding, spilling lava-like green goo in to the giant vat of oil. Yes, let’s do that. Let’s have the best of both worlds. Place the avocado flesh, tomatillos, garlic, jalapeno, cilantro and salt in to a blender or food processor; pulsate until smooth. Transfer to a bowl and set aside. (A great tutorial for wrapping can be found here) Place 1 spring roll wrapper on a clean work surface, with one corner at the bottom so that it resembles a diamond. Brush the four edges of the wrapper with water. Next, add 1 TB of the avocado mixture, a sprinkle of black beans, and 2 thin slices of red onion on the top part of the wrapper closest to you, not touching the edges. Tuck the end of the wrapper under the filling and begin to gently fold down creating a log until you reach the halfway point. Fold over the left side, and then the right side and roll it up to form a tube. Brush a little more water along the top part and seal the roll. Repeat until all the rolls are finished. Place the pan with the ¼ cup of the oil over a medium-high heat. Once the oil begins to ripple, fry 4-5 spring rolls at a time (depending on the size of your pant) until lightly brown on each side. This will only a minute or two. Put them on a paper towel to drain. You will need to replenish the ¼ cup of oil in the pan after about 2 batches. Repeat until all the rolls are finished. I am unnaturally afraid of spring rolls. And phyllo dough. It's a theme. these look amazing though... I need to man up! I think I've seen people bake spring rolls too... have you ever tried it? Same here. It's not natural for me to play with dough. Never the less, these were amazing. I do wonder how baking them would work...if they would be more crunchy and less delish. Maybe I should try that next time! WOW!! these sound fantastic! I love the crossing of cultures! As Grub's Mom, I had the distinct pleasure of chatting with her on skype as she prepared these little gems. I could practically smell them as we talked and drooled as she and my hardworking SIL inhaled them. I can't describe to you how much I wanted one. I even tried to grab one out of her hands and she munched [it didn't work!]! Avocados MMMMmmmm...... These look amazing! Amazing! Very interesting ,giving a new twist to the ordinary spring rolls! LOVE IT! Very chic & gourmet! 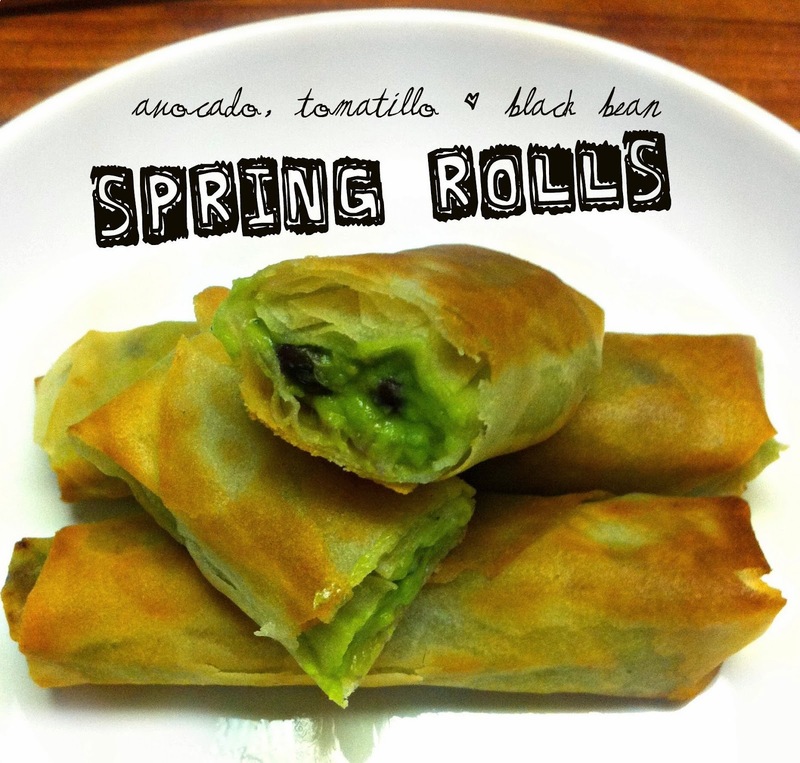 This is my first time seeing avocado and beans in spring rolls and I love the idea!!! Being an Asian person I always stay in the safe comfort zone in terms of making spring rolls. This is a very creative way to eat them and they look delicious! Wow. That is a huge compliment coming from you. Thanks! My husband is a spring roll addict so I love making up new flavors for him. Do you ship these delicious rolls? I love every single ingredient you've used. Great idea to panfry too. I know what you mean, sometimes nothing will do it for ya like frying something up! I'm in heaven. These look delicious! I am so hungry for these rolls, they look so tasty. Anything with avocado I can it it anytime. Thank you for a wonderful recipe.